In a previous post on LinkedIn’s Talent Blog, I offered a semi-futuristic version of a recruiter competency model. In a more recent post, I suggested there were some serious downsides to using AI to be more efficient separating strong from weak candidates. 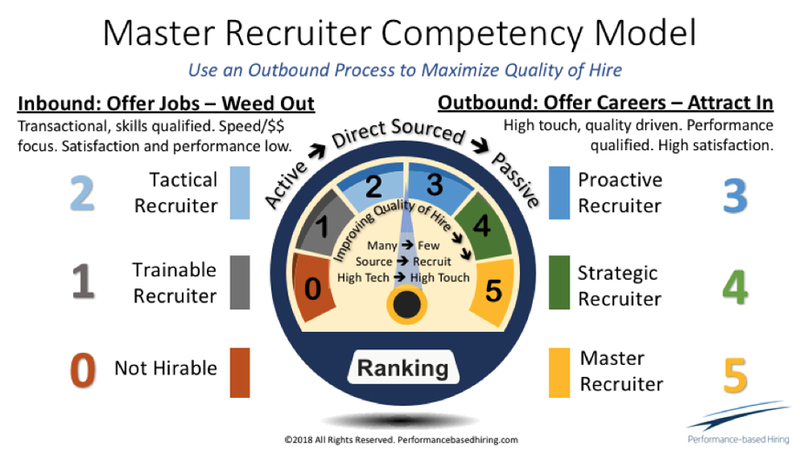 The differences are clearly shown in the Master Recruiter Competency Model graphic comparing the Inbound recruiting process shown on the left to the Outbound process on the right. At its core, the Inbound process is designed to fill jobs as efficiently as possible with people who are unemployed, underemployed, or dissatisfied with their work and who are perfectly qualified. Underlying all of this is the flawed assumption that there is a surplus of fully qualified people like this who are willing to take a generic job and hope things will turn out okay. Research shows that 150-200 people typically apply to job postings for every person hired. AI (artificial intelligence) is being used to make this matching process more efficient but it’s replacing those sourcers and recruiters who previously did the screening and filtering. What I find surprising is that by making job postings more compelling, companies would be able to attract stronger candidates with AI doing the heavy lifting. However, it seems that reliance on skills-laden job descriptions is still the norm. This Inbound process is shown on the left side of the recruiter competency meter, and for those recruiting these candidates the best score possible is a high “Level 2” out of a possible 5. This means the person is a very efficient transactional recruiter filling jobs with the most skills-qualified people who apply. The Outbound hiring and recruiting process is fundamentally different. It involves reaching out directly to preselected people in order to get them interested in an open job. At the crudest level, this involves emailing people who have the skills listed on the job description in the hope they’ll be enticed into considering an ill-defined lateral transfer. The most professional Outbound process involves redefining the job as a series of performance objectives and challenges and prospecting for people who would see this opening as a true career opportunity. By getting the hiring manager to agree to this redefinition of work and agreeing to meet everyone who is qualified, fewer candidates need to be screened and presented to generate 2-3 finalists. Part of this is because the response rates to Outbound messages will naturally be higher when the offer is to engage in an exploratory career conversation rather than forcing the person to apply. End-to-end, this is a high touch relationship building process involving networking and a lot of exploratory conversations but it only requires 15-20 prequalified candidates at the top of the funnel. This is what I refer to as “Small Batch, High Touch” sourcing and recruiting. The idea is that recruiters will be spending more time with fewer people, so time to fill will be the same or lower, but quality of hire will be higher. Research shows that the best talent is hired via an Outbound process where candidates and companies alike conduct the proper due diligence. This is not unexpected when people are hired for the right long-term career reasons rather than to alleviate short-term problems. This Outbound “Attract In” process is represented by the right side of the recruiter competency meter. Being proactive is the first step. 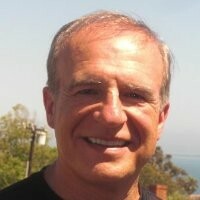 It requires getting the hiring manager to agree to the change in defining work from skills to performance qualified. Being strategic takes the process up a notch by considering how to reach the entire talent market rather than just those who apply. Mastery is achieved when the recruiter owns his/her talent market and is a recognized subject matter expert by hiring managers and candidates alike. While AI has tremendous value when used properly for recruiting purposes, using it to make a fundamentally flawed Inbound process more efficient seems misguided to me. Despite these concerns, recruiters and sourcers better get on the right side of the Recruiter Competency Model if they want to make a real and continuing difference.